If you have a lot of accessories and you need 2-3 wardrobes to store them, then you are probably reading the right article. 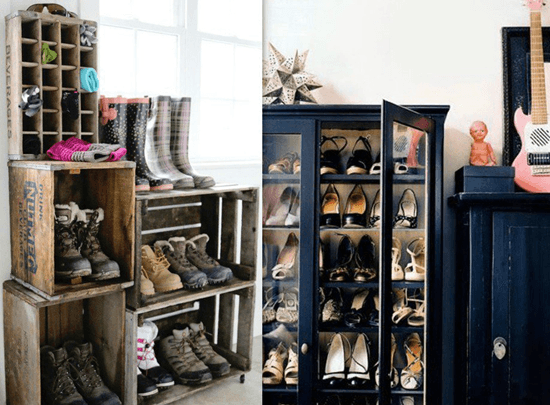 See below some smart ideas to store your shoes and accessories in your home, as suggested by the interior designers of Epic Home Ideas. In home ware stores you can find special hooks, like those in the picture below, that are used in a variety of ways in the home. One of them is for hanging your shoes. Put some hooks on the wall and hang your shoes there. Just be careful not to put too many hooks because then the result may be unappealing. If you choose to hang the shoes on the wall in this way, make sure they are clean if the wall is in the living room or in the entryway. Put some hooks on the wall and hang your hats there. You can do it next to the front door to make the place more aesthetically pleasing or anywhere else in the house. Hang your hats on the wall and put all your sunglasses in beautiful transparent plastic or glass boxes. Place a base of your choice on the wall and on top of it, put a bar in a color shade that suits your room decoration. Put all your necklaces and bracelets on the bar – or those you wear most often. If you have a ladder that you do not use much, then you can use it as a nice decoration. Hang your scarves, sunglasses, scarves and handkerchiefs there. 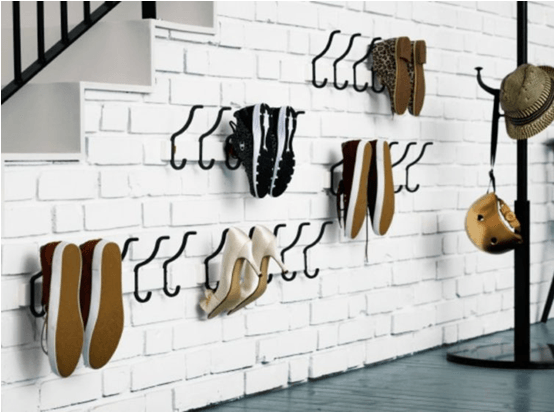 Put your shoes in a beautiful order on the wall and place your accessories on an unused staircase. Take some boxes and place them next to each other and in different order depending on how many shoes you want to store. Use a box with partitions to store your socks. 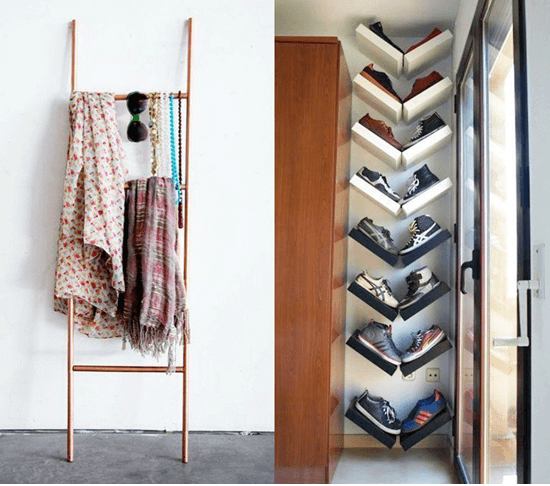 It is advisable that this custom-made shoe rack is not in your bedroom. If you have an old display furniture unit and you want to replace it, do not throw it away. Turn it into a show rack and put it in a room or in the hallway. Display units are a good alternative for this job and fit several pairs of shoes. Old boxes and a display furniture can become a nice, improvised shoe rack. Place frames and shelves and put your shoes in and on them. This way you will be able to store some pairs while turning your favorites into artwork. Store and highlight your favorite shoes at the same time with this improvised gallery. The rails commonly found in the bathroom for placing towels can be a good source of inspiration. Install, for example, 2 golden rails in your room and put your accessories on them. If you have plenty of old platters and you do not know what to do with them, use them as a storage area for your sunglasses, accessories, or belt collection. Put two platters in the hall or even in the bathroom and place your accessories neatly. A large platter will help you have your accessories in order and in a plain sight so you can see and wear them more easily.